Has nothing to do with my disdain or not thinking like me. If you dismiss the fact that its twice the price with half the features of its competitor just because its an Apple product, thats foolish. Again, imo. They do this price gouging across most of their products and people excuse it. Look at the cost to get fast charging on a $1000-1150 iPhone X. $75? Yet people try and justify it. It is well known that Apple charges a premium price for it products, but those of us who have owned Apple products for a while knows very well what we’re getting for that premium price. Every smartphone, tablet, and desktop computer will be compared to their counterparts from Apple and it has nothing to do with price. They are all judged based on how they stack up against Apple’s products. As for justifying their prices, I think I do sometimes. Let’s take for instance, the iPhone X. I said on several occasions that I was unwilling to pay over $999 for a smartphone and I meant it. Fast forward to the day after the iPhone X hit the shelves in which I entered an Apple Store and purchased one. Am I glad I bought it? Heck yeah! Did I like shelling out $1200 for it? Nope. Do I think it’s still expensive? Sure do. Am I satisfied with the purchased despite the price? Yes I am. Let’s talk about the iMac Pro for a moment. That thing cost $5K. Ain’t no way in heck will I pay $5K for a computer. That’s NOT going to happen! With that in mind, if I was in a field where I needed to have a machine of that magnitude then I would probably fork over the money to get it. In other words, it would be worth it to me. As it stands right now, that’s a way overpriced machine, but I’m viewing it from my perspective based on what I need a computer for. The point is this. The justification for paying what Apple charges is based on a buyers overall needs. It’s not foolish because even the wealthiest among us have a limit to what they are willing to spend based on the perceived importance of it. TgeekB and Annie_8plus like this. Ok so its not a feature thing that has you intrigued, its more to do with having an open mind towards a new product? Im heavily critical of Apple products for various reasons. Mainly the cost they charge for the features you get. I am however honest enough to say if somebody or something informs me of something worthy of those price tags, I will give it a fair shot. Case in point, the Apple watch. I thought it was the stupidest thing ever released when it came out, even though Im a huge watch collector. I hated the design and redundancy of notifications but most importantly the price. Then my Apple fanboy employee started showing me what it was capable of and I bought one. At the release it was ok but I ended up selling. Now I have bought a 3rd gen version and I absolutely love it. The apps have progressed, the usefulness is now apparent to me and the price seems a bit more reasonable. This Homepod is baffling though. I just cant wrap my head around the potential of it. Its a speaker with a voice assistant that is severely lacking. It only streams one music service without a phone to utilize airplay, yet its so much more than the competition. I have begged the guy at work to make me see this things potential, primarily because he hasnt shut up about it in days, and Im getting nothing from him. Heres a grown man so excited about something but cant tell me why. I would happily throw my money at this thing if it made sense (I have an insane amount of speakers so this should be right up my alley) but I cannot for the life of me understand what makes this twice the price of the competition. I totally understand where you're coming from. The Watch wasn't something that I could see myself getting... and I still haven't. But more and more I want one... and am waiting because I've read that future models will be able to tell me my glucose levels... and being a diabetic, that is very exciting to me. As far as features, that's just it.... I don't know. I'm beginning to suspect that the potential is much broader than I've considered. And as one podcaster suggested, the Homepod may be instrumental in upgrading Siri among other things. So, as I've said before, time will tell! I do know that I'm much more interesting in what people have to say! But see thats just it. The items you mentioned, in a sense justify the price. My wife paid $1400 for my iPhone that I didnt want. Yes its expensive but they finally changed the design and brought the phone into the modern era so it deserved the high price tag. The features and design are justifiable towards the cost. The only way she knew I would use an iPhone again was if they finally changed the design they had been using for almost a decade. iMac Pro. Again, insane price point but the features it offers tailors to a consumer that will utilize those features to justify the price. There isnt anything to compare it to because of its intended design. The software on the mac alone justifies the cost. Now lets look at the Homepod. What feature or usage scenario justifies the outrageous cost when its lacking compared to its competitors? It sounds slightly better in smaller rooms than the Sonos? Does that really justify the cost? Is there something Im not seeing here besides the logo? You’re making my point. Everything is justifiable under the right circumstances, including the Home Pod. Once it hits the stores and we see for ourselves what it can do. Afterwards, we’ll decide if it will fit in our lives and if so, whether or not the price is worth it. Some will say it is and others will say that it isn’t. So theres features that it can do that we dont know about yet? I want ask anymore because everyone keeps saying “we’ll see what it can do” even though we know exactly what it can do. Hopefully theres something the reviewers havent found and the release notes didnt mention. That’s the truth. None of us know and won’t really know until we see for ourselves. Maybe. Maybe not, but it’s going to boil down to the individual. You know this. I don’t own any of the current crop of listening pods and I’m not setting out to own one from Apple. With that being said, when they hit the stores, I will indeed go and see for myself how it is. If I find the music capabilities to be as described by Serenity then I will consider purchasing it. Siri is not even a consideration on it for ‘me’. I use Siri with my iPhone only and that’s not going to change. Anyway, keep up the conversations in the forums. I really enjoy your feedback. Apple can price their products the way they do because they have forged a following of users (not fools) who have, in the past, been both satisfied with their products as well as their customer service. Each individual can decide if they want to pay those prices or not. There is no need to judge. There is also no reason an individual needs to justify why they are purchasing a new Home Pod. They will buy it and either be satisfied or not which will influence their next buying decision. Apple seems to be doing something right. I did not want an iPad, because it seemed stupid, just a large iPhone w/o voice.. (back with iPad 1).. yet, I am on my 3rd iPad, and use it daily. Did not know about the Apple Airpods, because I had really good wired in-ear headphones and they worked fairly well. But now that I have them, I can't imagine not having them. I never wanted the Apple Watch, I stopped wearing watches, but got one this year for Xmas (Series 3 w/ Cellular) now I love it and use more than I thought. To sum up, my HomePod will be ready to pick up (hopefully) on 2/9 from BB. Last edited by Craig; 01-31-2018 at 01:58 PM. No Bluetooth streaming? That seems like a huge mistake. That’s debatable. The following excerpt from the article ‘seems to suggest’ an inability to connect via Bluetooth from Android devices. Thats how I read it also. It seems they are strictly targeting apple users which may not be the best idea. Not sure why you would eliminate one of the most popular ways to connect when it has the ability. Anyone who questions if theyll stay with Apple would most likely pass on this. The value I see with the homepod is that I am no longer tethered to a speaker when I stream Apple Music. Being able to stream directly through it instead of through my TV speakers from my Apple TV or from my phone to a bluetooth speaker. So long as Siri hear me and understands, play such and such playlist, that is all I need it to hear. And if I walk more than 33 feet from a speaker with my phone, the music will still play. You can only do this via Siri if you subscribe to iTunes Match or Apple Music, otherwise, you will need to use AirPlay to stream. Siri will still work for basic commands like it does on your phone etc. So I have to eat a little crow here. A friend of mine purchased one and while I was at their house I was blown away. I decided to pick one up and put it in my office and it spectacular. Although it does appear that I may have been right about sales as its not selling very well. Just_Me_D and TgeekB like this. 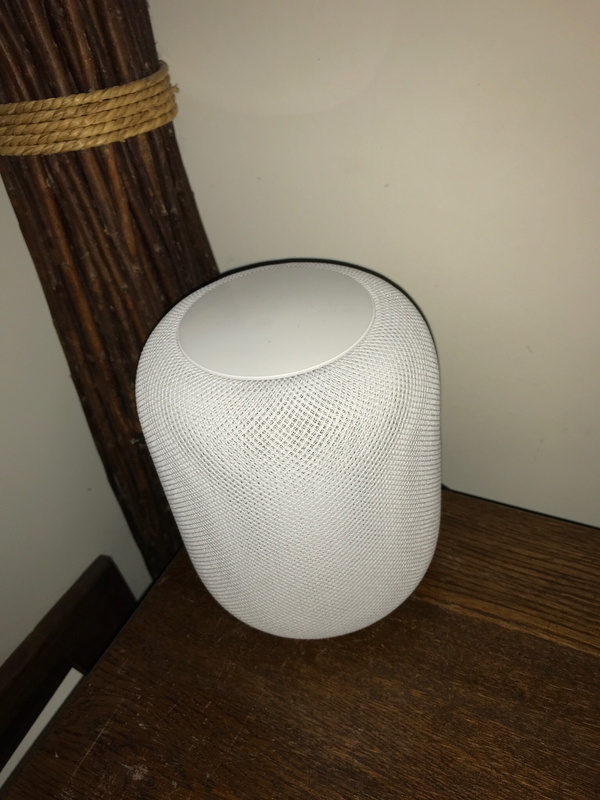 Yeah, the sound that emits from the HomePod is definitely top notch, and if you know Siri’s limitations, the overall package is pretty good, in my opinion. Siri needs to be much more capable, but retain its local processing instead of going ot the cloud for almost everything as the other assistants do. Siri needs to do a better job of understanding the user's question when you first start to use Siri and to show noticeable improvements as you continue to use Siri. Thus, Siri needs better algorithms and more processing power on the device. Perhaps, Apple should devote a new processor and a special memory area to Siri in new devices.